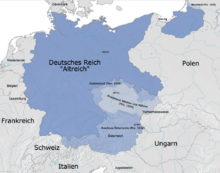 The Anschluss (or Anschluß) was the annexation of Austria by Germany in 1938. After the First World War, when both the Austria-Hungary Empire and the German Empire were abolished, many hoped that the Republic of German Austria would be unified with the German Republic in hope for a Greater Germany, which was to include all Germans. This was forbidden by the Treaty of Versailles. Native Austrian Adolf Hitler met Austrian Chancellor Kurt Schuschnigg on 12 February 1938 in Berchtesgaden, Bavaria and ordered him to end the ban on political parties, reinstate full party freedom, release all imprisoned members of the Nazi party and let them take part in the government. Hitler said to do this or face an invasion as he was to make union between Austria and Germany by any possible means. In January 1938 Schuschnigg had been told to fire the chief of staff of the Austrian Army, Alfred Jansa, from his position. Jansa and his staff had plans for defending Austria against a Wehrmacht attack. Hitler did not want this to happen. Schuschnigg realised that his new ministers were trying to take over from him. To get support Schuschnigg allowed socialists and communists legally to appear in public again. The parties had been banned on 12 February 1934 in the Austrian Civil War. The communists said they supported the Austrian government. The socialists wanted more promises from Schuschnigg before they were willing to side with him. Meanwhile, Austrian President Wilhelm Miklas refused to appoint Seyß-Inquart as Chancellor and asked other Austrian politicians instead. However, the Nazis were well organised. Within hours they managed to take control of many parts of Vienna, including the Ministry of Internal Affairs (controlling the Police). As Miklas continued to refuse to appoint a Nazi government and Seyss-Inquart still could not send a telegram in the name of the Austrian government demanding German troops to restore order, Hitler became furious. At about 10 PM, well after Hitler had signed and issued the order for the invasion, Göring and Hitler gave up on waiting and sent a forged telegram pretending to be a request by the Austrian Government for German troops to enter Austria. Around midnight, after nearly all critical offices and buildings had fallen into Nazi hands in Vienna and the main political party members of the old government had been arrested, Miklas finally appointed Seyss-Inquart Chancellor. Voting ballot from 10 April 1938. 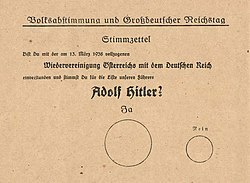 The ballot text reads "Do you agree with the reunification of Austria with the German Empire that was enacted on 13 March 1938, and do you vote for the party of our leader Adolf Hitler?," the large circle is labelled "Yes," the smaller "No." On the morning of 12 March, the 8th Army of the German Wehrmacht crossed the German-Austrian border. They were not stopped by the Austrian Army, instead the Wehrmacht troops were greeted by cheering Austrian Germans with Hitler salutes, Nazi flags and flowers. This is why the annexing of Austria without one single shot being fired is sometimes called the Blumenkrieg (war of flowers). On 2 April 1938, 200,000 Austrians gathered on the Heldenplatz (Square of Heroes) to hear Hitler proclaim the Austrian Anschluss. Hitler later commented: "Certain foreign newspapers have said that we fell on Austria with brutal methods. I can only say: even in death they cannot stop lying. I have in the course of my political struggle won much love from my people, but when I crossed the former frontier (into Austria) there met me such a stream of love as I have never experienced. Not as tyrants have we come, but as liberators." The Simple English Wiktionary has a definition for: anschluss. ↑ 2.0 2.1 "1938: Austria". MSN Encarta. Retrieved 2007-03-11. ↑ 3.0 3.1 Mayerhofer (1998). "Österreichs Weg zum Anschluss im März 1938" (in German). Wiener Zeitung Online. Retrieved 2007-03-11. Detailed article the on the events of the Anschluss, in German. ↑ "Video: Hitler proclaims Austria's inclusion in the Reich (2 MB)". Retrieved 2007-03-11. ↑ "Anschluss". Spartacus Educational. Retrieved 2007-03-11. ↑ "Die propagandistische Vorbereitung der Volksabstimmung". Austrian Resistance Archive. 1988. Retrieved 2007-03-11. This page was last changed on 12 April 2019, at 15:01.